Recipe created by chefs Mary Sue Milliken and Susan Feniger for the California Avocado Commission. For Dressing: Whisk together yogurt, lime juice and honey in a small bowl. 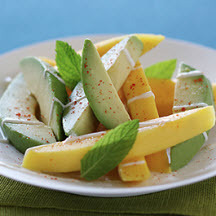 For Salad: Slice avocado and mango halves lengthwise in 1/2-inch slices. Arrange the fruit on individual salad plates, alternating the avocado and mango slices. Mix equal parts cayenne pepper and salt and lightly sprinkle over fruit slices, to taste. Just before serving, spoon 2 to 3 tablespoons of dressing in a stripe over each salad. Garnish with mint sprigs and serve immediately. Nutritional Information Per Serving (1/4 of recipe): Calories: 269; Total Fat: 12g; Saturated Fat: 2g; Cholesterol: 3mg; Total Carbs: 43g; Fiber: 5g; Protein: 5g; Sodium: 168mg. Recipe and photograph courtesy of California Avocado Commission.